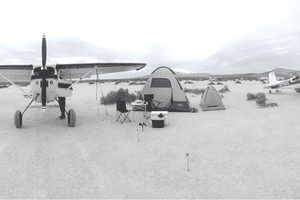 There’s just something about the High Sierra desert that sets the scene for the best airplane camping ever. If you've never been to the High Sierra Fly-In, make it your new bucket-list item. Described before as "a Burning Man for pilots," it's by far my favorite aviation event ever. The High Sierra doesn’t disappoint for those who love the western United States and its fresh air and mountains. But the magic of the west is really about the people. When you combine the wonder of the high desert landscape with the charm and hospitality of the best people in the world and then add airplanes, well, it just doesn’t get any better. Dead Cow is a dried up lake bed in middle-of-nowhere, Nevada, just north of Reno, and it's the new location of the High Sierra Fly-In. The land was recently purchased by the event organizer Kevin Quinn after battling with the BLM for land in which he could safely hold the fly-in event, which, after six years, has become significant in size. Dead Cow is easiest to access by air, and had it not been for the genuine hospitality of the gracious people running and participating in this fly-in, it would not be such a great event. You'll be greeted by a friendly, lighthearted crowd of pilots who guarantee no regrets for those who make the trip. Quinn and the other organizers were sure to make everyone - tricycle gear pilots, Mooney and Cirrus pilots, RV pilots, even RC pilots, and of course, future pilots - feel at home. Anyone who could land on a wide open dried up lake bed was encouraged to fly in. For those who didn't have an airplane of their own, there were others who were willing to offer a seat. Now, it might sound crazy for a person to just hop into just anybody’s airplane, but aviation is a small world, and strangers become friends quickly. Depending on where you're coming from, you may enjoy a spectacular flight through the canyons of Idaho, a nice view of the Owyhee mountains in Oregon or the high plains of northern Nevada. Quinn offers a pilot briefing around the fire at 7 a.m., and these bush pilots, who often have an unfair reputation for being daring and reckless, were among the safest and most competent pilots you'll meet. There were rules, standards, and protocol. There were separate frequencies for different operations, a standard traffic pattern, and clearly no room for unprofessional behavior. Safety culture lies in the behavior of the leaders of an organization, and Quinn set the standard for safety early on, perhaps on edge a bit after a midair collision during the previous year's fly-in. During the day there's fly-outs to dirt strips, grass strips, dirt roads, lake beds, and flights over the scenic Pyramid Lake. The Susanville Airport (KSVE) is nearby for fuel. Flying in formation, you may spot elk and wild horses, and in the middle of the Black Rock Desert, there's the site of Burning Man. The scheduled STOL drag races bring intense moments, and you may catch experienced air show pilot Gary Ward fly his MX2. There's Piper Cubs and Super Cubs and 180s and 185s and 170s and 172s and Archers and Mooneys and Cirrus' and Maules and Experimentals. It was a pilot's version of heaven. Something about the atmosphere of this fly-in coupled with the vastness of the powerful high desert landscape is stunning. The wide open sky at night takes your breath away. The flights through the canyons, above the wild horses, over the immense and seemingly infinite desert - it all makes you feel small and insignificant in this great big world. Something about all of this together just makes a person feel alive. Dead Cow is just a dusty, dried-up lake bed, which, for a few days each October is full of airplanes, but the High Sierra Fly-In experience is one that makes you feel incredibly small but larger-than-life at the same time. It's an aviation experience that can't be replicated anywhere else. If you ever get the opportunity to go, just do it. You will be welcomed with open arms, you'll make new friends, and you'll witness spectacular flying and starry nights.